When arranging a wedding overseas, the comfort of the guests is always a high priority, especially those who have come from overseas. A nice personal touch is to arrange for gifts to be placed in the guests’ hotel rooms – be it something simple, such as a bottle of water and sweets, to more elaborate personalized gifts. Another important aspect to consider is transportation of the guests from their hotels to the wedding location. 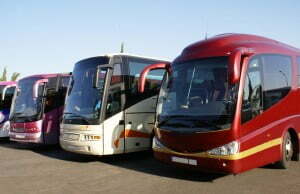 The most convenient, of course, is to arrange coaches, which also ensures the guests arrive at the wedding on time. It is essential to use a well-established coach or bus company, and to provide the coach drivers with the directions and exact address of the event. Sometimes clients insist on using a particular coach company, because their quote appears cheaper than the more well-known companies. However, this can prove to be a false saving. One of my clients was adamant that we hire a coach company owned by friend of theirs. I advised them that I was very reluctant to use a company that was unknown to me, but they were insistent. I asked one of my team to be at the hotel when the coaches were due to arrive, and wasn’t overly surprised when I was told that the coaches were late, in spite of the fact that we had phoned the company numerous times to confirm the timing. My assistant ensured that the guests stayed inside the air-conditioned hotel, and were supplied with drinks whilst they waited. The coaches eventually arrived, driven by very gruff impatient drivers. Fortunately, my assistant had copies of the directions to the venue, as the coach company had omitted to give this is to the drivers. The coaches eventually arrived at the wedding venue, albeit 30 minutes later than planned. To my astonishment, the drivers – in their not over-clean clothes – entered the Garden with the guests, and proceeded to help themselves to the reception food. My assistant asked them politely to leave the reception, to which the drivers took great offence, but reluctantly returned to their coaches – but not before they filled their plates with food, and glasses with drinks. At midnight, the drivers approached me, and told me the guests had to board the coaches. I pointed out that the contract stipulated that the coaches stayed until 2.00 a.m., when the party was scheduled to finish. The drivers became so angry, that I tried to contact the head-office, but of course there was no-one to speak to. At last, they calmed down, and went to sit outside the Garden to wait for the party to end – or so I thought. At 12.30 a.m., I went to check on the state of the toilets – when I returned I was shocked to find all the guests rushing to the coaches. After questioning the guests, I discovered that, in my absence, the drivers went on to the dance-floor and announced that the coaches were leaving, and that the guests had to immediately leave the wedding. Trying to stay calm, my assistants and I ran to the coaches, and explained to all the guests that the drivers had made a big mistake, and they were all invited back to the dance-floor. Fortunately, the bride and groom, and their guests, found the situation very amusing, and the party continued as planned until 2.00 a.m. The next day, the clients apologized for not taking my advice about the coaches, and thanked us for handling the situation in such a professional and calm manner. Wedding In Israel	How to plan a Wedding in Israel?